Support for new international law to ban fully autonomous weapons–killer robots–and retain meaningful human control over the use of force is growing rapidly. Yet the Campaign to Stop Killer Robots is dismayed that a small number of military powers are actively preventing progress towards this goal. The campaign strongly objects to permitting the development of weapons systems that, once activated, would be able to select and attack targets without human intervention. Doing so would be abhorrent, immoral, and an affront to the concept of human dignity and principles of humanity. The 88 states participating in the sixth meeting on lethal autonomous weapons systems at the Convention on Conventional Weapons (CCW) have recommended continuing the CCW deliberations on this topic next year. There was strong convergence on the need to retain some form of human control over weapons systems and the use of force at the meeting yet states failed to agree on the best way to achieve this objective. The week-long meeting concluded at 1:15am on Saturday, 1 September after states finally agreed on their negotiated report. 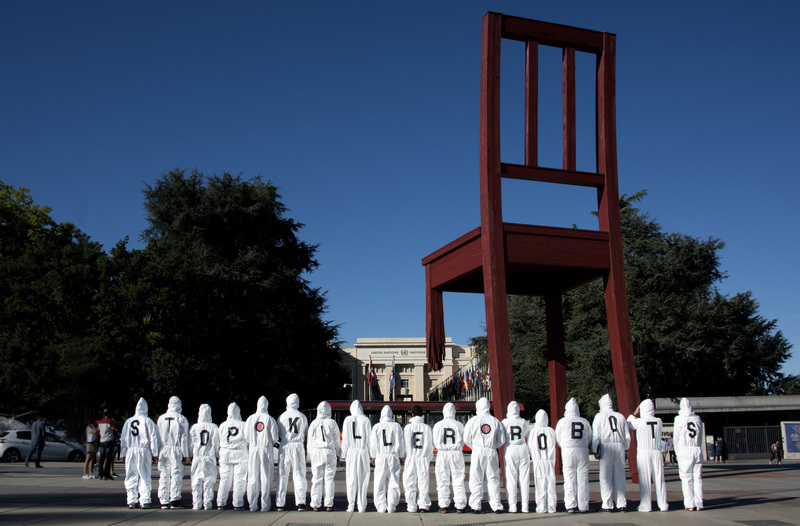 A majority of states proposed commencing negotiations in 2019 on a new treaty to prevent the development and use of lethal autonomous weapons systems. Many states called for a preemptive ban treaty, including Colombia, Iraq, Pakistan, Panama, a group of African states and the Non-Aligned Movement (NAM) group of states. Austria, Brazil and Chile recommended a new CCW mandate “to negotiate a legally-binding instrument to ensure meaningful human control over the critical functions” of weapons systems. Some states suggested the CCW to focus on future deliberations on other measures, such as a non-legally-binding political declaration proposed by France and Germany to outline principles such as the necessity of human control in the use of force and the importance of human accountability. A handful of states said that the talks on fully autonomous weapons should continue, but strongly opposed any work aimed at a new treaty, political declaration, or any other new measures to address the dangers posed by these weapons. These states–Australia, Israel, Russia, South Korea, and the United States–repeatedly expressed their desire to explore potential “advantages” or “benefits” to developing and using lethal autonomous weapons systems. The CCW states parties, meeting formally as a Group of Governmental Experts (GGE), were tasked with making a recommendation on future work to the CCW annual meeting in November. Despite the fact that a majority of states called for a legally-binding instrument, and many called for a political declaration, the GGE rejected those options. Due to its “consensus” decision-making rule used by the CCW the campaign is frustrated that the only recommended action states could manage to take was to continue with their current mandate of exploring “options” for future work. The final decision on future work will be taken by states at the CCW’s annual meeting on 23 November 2018, also at the UN in Geneva. The Campaign to Stop Killer Robots will continue to grow in strength and numbers the longer states take to negotiate a new international treaty. Will urge the public not to let the world continue down this dangerous path. Demand that your government work to draw a normative line on autonomy in weapons systems now.